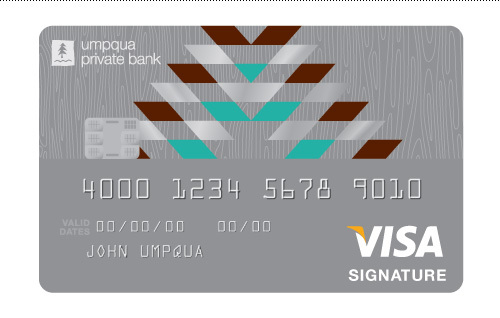 One of the more unique projects I’ve worked on recently is designing a Visa card for Umpqua Private Bank’s customers. These people have serious money and need a card to go along with it. Ka-ching^10! The Visa card was created in conjunction with launching a new site for Umpqua Private Bank in 2012. After working on various nature-based and Pendeleton-themed designs under the art direction of Kate Zimmerman and Mark Jacobs at Umpqua, we chose a final design that combined a geometric sunrise in the UPB color palette with a wood pattern background that mirrored the website background. The silver parallelograms received a special foil treatment for that extra bling. 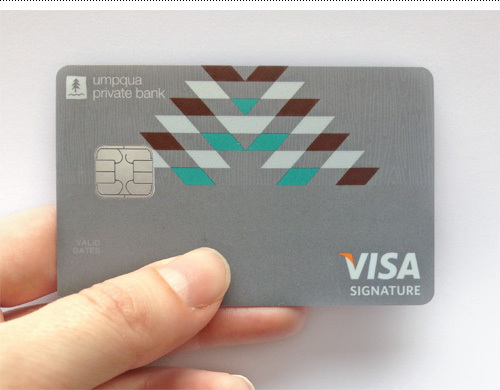 The card in real life – a blank version of the Visa card design for Umpqua Private Bank.